The 2011 Joplin tornado was a catastrophic EF5-rated multiple-vortex tornado that struck Joplin, Missouri, late in the afternoon of Sunday, May 22, 2011. It was part of a larger late-May tornado outbreak and reached a maximum width of nearly 1 mile (1.6 km) during its path through the southern part of the city. This particular tornado was unusual in that it intensified in strength and grew larger in size at a very fast rate. The tornado tracked eastward across the city, and then continued eastward across Interstate 44 into rural portions of Jasper County and Newton County. It was the third tornado to strike Joplin since May 1971. Overall, the tornado killed 158 people (with an additional three indirect deaths), injured some 1,150 others, and caused damages amounting to a total of $2.8 billion. It was the deadliest tornado to strike the United States since the 1947 Glazier–Higgins–Woodward tornadoes, and the seventh-deadliest overall. It also ranks as the costliest single tornado in U.S. history. Insurance payout was $2.8 billion; the highest in Missouri history, with the previous record of $2 billion being the April 10, 2001 hail storm. The tornado initially touched down just east of the Missouri-Kansas state line near the end of 32nd Street at 5:34 pm CDT (22:34 UTC) and tracked due east, downing a few trees at EF0 intensity. Eyewitnesses and storm chasers reported multiple vortices rotating around the parent circulation in that area. Civil defense sirens sounded in Joplin 20 minutes before the tornado struck in response to a tornado warning issued by the National Weather Service, but many Joplin residents didn't heed them. The tornado strengthened to EF1 intensity as it continued through rural areas towards Joplin, snapping trees and power poles and damaging outbuildings. Widening, the tornado then tracked into the more densely populated southwest corner of the city near the Twin Hills Country Club. It heavily damaged several homes at a subdivision in this area at EF1 to EF2 strength. The tornado continued to strengthen as it ripped through another subdivision just east of Iron Gates Rd. Numerous homes were destroyed at EF2 to EF3 strength at that location, and multiple vehicles were tossed around, some of which were thrown on or rolled into homes. Destroyed area in the tornado's damage path. The now massive wedge tornado then crossed S. Schifferdecker Ave., producing its first area of EF4 damage as several small but well-built commercial buildings were flattened. Consistent EF4 to EF5 damage was noted east of S Schifferdecker Ave and continued through most of southern Joplin. Numerous homes, businesses, and medical buildings were flattened in this area, with concrete walls collapsed and crushed into the foundations. A large steel-reinforced step and floor structure leading to a completely destroyed medical building was "deflected upward several inches and cracked". Steel trusses from some of the buildings were "rolled up like paper", and deformation/twisting of the main support beams was noted. Multiple vehicles were thrown and mangled or wrapped around trees nearby. Several 300-pound concrete parking stops anchored with rebar were torn from a parking lot in this area and were thrown up to 60 yards away. Iowa State University wind engineer Parka Sarkar was able to calculate the force needed to remove the parking stops and found that winds exceeding 200 mph were needed to tear them from the parking lot. EF5 damage to the St. John's Regional Medical Center, which later had to be torn down due to deformation of its foundation and underpinning system. Damage became remarkably widespread and catastrophic at and around the nearby St. John's Regional Medical Center, which lost many windows, interior walls, ceilings, and part of its roof; its life flight helicopter was also blown away and destroyed. Five fatalities were caused by loss of backup power, and the nine-story building was so damaged that it was deemed structurally compromised, and was later torn down. According to the NWS office in Springfield, Missouri, such extreme structural damage to such a large and well-built structure was likely indicative of winds at or exceeding 200 mph. Vehicles in the hospital parking lot were thrown into the air and mangled beyond recognition, including a semi-truck that was tossed 125 yards and wrapped completely around a debarked tree. Wind-rowing of debris was noted in this area, and additional concrete parking stops were removed from the St. John's parking lot as well. Virtually every house near McClelland Boulevard and 26th Street was flattened; some were swept completely away, and trees sustained severe debarking. As the tornado tracked eastward, it maintained EF5 strength as it crossed Main Street between 20th and 26th Streets. It heavily damaged every business along that stretch and several institutional buildings were virtually destroyed. It tracked just south of downtown, narrowly missing it. Entire neighborhoods were leveled in this area with some more homes swept away, and trees were stripped completely of their bark. At some residences, reinforced concrete porches were deformed, or in some cases completely torn away. Damage to driveways was noted at some residences as well. Numerous vehicles were tossed up to several blocks away from the residences where they originated, and a few homeowners never located their vehicles. A large church, Greenbriar Nursing Home, Franklin Technology Center, St. Mary's Catholic Church and School, and Joplin High School were all destroyed along this corridor. The Greenbriar Nursing Home was completely leveled, with 21 fatalities occurring there alone. As the tornado crossed Connecticut Ave further to the east, it destroyed several large apartment buildings, a Dillon's grocery store, and a bank. Only the concrete vault remained at the bank, and a wooden 2x4 was found speared completely through a concrete curb at one location as well. No one was in the high school at the time; the high school graduation ceremonies held about 3 miles (4.8 km) to the north at Missouri Southern State University had concluded shortly before the storm. Pieces of cardboard were found embedded sideways into stucco walls that remained standing at Joplin High School. Steel beams and pieces of fencing were deeply embedded into the ground in fields near the high school as well, steel fence posts were bent to the ground in opposite directions, and a school bus was thrown into a nearby bus garage. The tornado then approached Range Line Road, the main commercial strip in the eastern part of Joplin, affecting additional neighborhoods along 20th Street. The now heavily rain-wrapped tornado continued at EF5 intensity as it crossed Range Line Road. In that corridor between about 13th and 32nd Streets, the tornado continued producing catastrophic damage as it was at its widest at this point, being nearly 1 mile (1.6 km) wide. As the tornado hit the Pizza Hut at 1901 South Range Line Road, store manager Christopher Lucas herded four employees and 15 customers into a walk-in freezer. With difficulty closing the door, he wrapped a bungee cable holding the door shut around his arm until he was sucked out and killed by the tornado. The tornado completely destroyed Walmart Supercenter No. 59, a Home Depot, and numerous other businesses and restaurants in this area, many of which were flattened. Numerous metal roof trusses were torn from the Home Depot building and were found broken and mangled in nearby fields. Cars that originated at the Home Depot parking lot were found hundreds of yards away. Asphalt was scoured from parking lots at Walmart and a nearby pizza restaurant, and large tractor-trailers were thrown up to 200 yards away. An Academy Sports + Outdoors store along Range Line sustained major structural damage, and a chair was found impaled legs-first through an exterior stucco wall at that location. A nearby three-story apartment complex was also devastated, and two cell phone towers were found collapsed onto the remains of the apartments. Numerous cars were thrown and piled on top of each other, 100-pound manhole covers were removed from roads and thrown, ground scouring occurred, and a Pepsi distribution plant was completely leveled in this area as well. Additional calculations of the manhole covers in Joplin by Parka Sarkar revealed that winds had to have exceeded 200 mph for the manhole covers to be removed. Many fatalities occurred in this area, and damage was rated as EF5. Extreme damage continued in the area of Duquesne Road in southeast Joplin. Many houses and industrial and commercial buildings were flattened in this area as well. The industrial park near the corner of 20th and Duquesne was especially hard hit with nearly every building flattened. Several large metal warehouse structures were swept cleanly from their foundations, and several heavy industrial vehicles were thrown up to 400 yards away in this area. One of the many warehouses affected was a Cummins warehouse, a concrete block and steel building which was destroyed. The last area of EF5 damage occurred in the industrial park, and a nearby Fastrip gas station and convenience store was completely destroyed. Many homes were destroyed further to the east at EF3 to EF4 strength in a nearby subdivision, and East Middle School sustained major damage. The tornado then continued on an east to east-southeast trajectory towards Interstate 44 where it weakened; nonetheless, vehicles were blown off the highway and mangled near the U.S. Route 71 (Exit 11) interchange. The damage at and around the interchange was rated EF2 to EF3. The weakening tornado continued to track into the rural areas of southeastern Jasper County and northeastern Newton County where damage was generally minor to moderate, with trees, mobile homes, outbuildings, and frame homes damaged mainly at EF0 to EF1 strength. The tornado lifted east of Diamond at 6:12 pm CDT (23:12 UTC) according to aerial surveys. The tornado's total track length was at least 22.1 miles (35.6 km) long. Overall, 6,954 homes were destroyed, 359 homes had major damage and 516 had minor damage, 158 people were killed, and 1,150 others were injured along the path. A separate EF2 tornado touched down near Wentworth from the same supercell about 25 miles (40 km) east-southeast of Joplin. A preliminary survey of the tornado damage by the National Weather Service office in Springfield, Missouri, began on May 23. The initial survey confirmed a violent tornado rated as a high-end EF4. Subsequent damage surveys, however, found evidence of more intense damage, and so the tornado was upgraded to an EF5 with estimated winds over 200 mph (320 km/h), peaking at 225 to 250 mph (360 to 400 km/h). According to the local branch of the American Red Cross, about 25% of Joplin was destroyed, but the city's emergency manager stated that the number was between 10 and 20%, with roughly 2,000 buildings destroyed. According to the National Weather Service, emergency managers reported damage to 75% of Joplin. In total, nearly 7,000 houses were destroyed (most of which were flattened or blown away) and over 850 others were damaged. Communications were lost in the community and power was knocked out to many areas. With communications down, temporary cell towers had to be constructed. By May 24, three towers owned by AT&T and Sprint had been restored. Due to the severe damage caused by the tornado, the travelling Piccadilly Circus was unable to perform as scheduled. As a result, the circus employees brought their two adult elephants to help drag damaged automobiles and other heavy debris out of the roadway to make a path for first responders. East of Joplin, a Risk Management Plan facility released 3,000 to 5,000 pounds (1,400 to 2,300 kg) of anhydrous ammonia; it was contained within two days. The catastrophe and risk modeling firm Eqecat, Inc. has estimated the damage at one billion to three billion USD, but noted that the true damage is not yet known, since the firm does not have access to data on uninsured losses. More than 19,000 insurance claims had been filed by mid-June. The impact on the insurance industry is not so much the number of claims, but the cumulative effect of such a large number of total losses. More than 2500 local people employed in insurance have been involved in some capacity. It is assumed that State Farm will assume the largest share of these losses, having market share of 27% for homeowners insurance and 21% for automobile insurance. The $2.8 billion in damage is the largest amount for a tornado since 1950. As of May 2013, the official death toll from National Weather Service was listed at 158 while the City of Joplin listed the death toll at 161 (158 direct). The list was up to 162, until one man's injuries were found to be unrelated to the event. In one indirect fatality, a policeman was struck by lightning and killed while assisting with recovery and cleanup efforts the day after the storm. Shortly after the tornado, authorities had listed 1,300 people as missing, but the number quickly dwindled as they were accounted for. Many people were reported to have been trapped in destroyed houses. Seventeen people were rescued from the rubble the day after the tornado struck. The Missouri Emergency Management Agency reported more than 990 injured. Of 146 sets of remains recovered from the rubble, 134 victims had been positively identified by June 1. Due to the horrific injuries suffered by some victims, some different sets of remains were from a single person. On June 2 it was announced that four more victims had died. Six people were killed when St. John's was struck by the tornado. Five of those deaths were patients on ventilators who died after the building lost power and a backup generator did not work. The sixth fatality was a hospital visitor. The Joplin Globe reported that 54 percent of the people died in their residences, 32 percent died in non-residential areas and 14 percent died in vehicles or outdoors. Joplin officials after the tornado announced plans to require hurricane ties or other fasteners between the houses and their foundations (devices add about $600 US to the construction costs). Officials rejected a proposal to require concrete basements in new houses. Officials noted that only 28 percent of Joplin's new homes had basements as of 2009 compared with 38 percent two decades before. Officials said they rescued 944 pets and reunited 292 with owners. On June 10, 2011, it was announced that a rare fungal infection, zygomycosis, had been noted to cause at least eight serious cases of wound infection among the injured survivors, confirmed by reports to the Missouri Department of Health and Senior Services. In 2013, the American Society of Civil Engineers published a study disputing the tornado's initial EF5 rating, based on surveying damage on over 150 structures within a six mile segment of the storm's path. According to the report, over 83 percent of the damage was caused by wind speeds of 135 miles per hour or less, the maximum wind speed of an EF2 tornado. An additional 13 percent was caused by EF3 wind speeds, and 3 percent was consistent with EF4 winds. The study found no damage consistent with wind speeds over 200 miles per hour, the minimum threshold of an EF5 tornado. Researchers concluded that the inability to find EF5 damage was due to the absence of construction standards that were able to determine the necessary wind speeds. Bill Colbourne, a member of the engineering team that surveyed the damage, declared that "a relatively large number of buildings could have survived in Joplin if they had been built to sustain hurricane winds." However, the EF5 rating stood as the National Weather Service in Springfield, Missouri stated that their survey teams found only a very small area of EF5 structural damage and that it could have easily been missed in the survey (at and around St. John's Medical Center). Bill Davis, head of the NWS station in Springfield, said that the results of the study "do not surprise me at all," adding that "there was only a very small area of EF5 damage in Joplin...we knew right off the bat there was EF4 damage. It took us longer to identify the EF5 damage and that it would take winds of over 200 miles per hour to do that damage." Additionally, the basis for the EF5 rating in Joplin was mainly contextual rather than structural, with non-conventional damage indicators such as removal of concrete parking stops, manhole covers, reinforced concrete porches, driveways, and asphalt were used to arrive at a final rating of EF5, as it was concluded that these specific instances of damage were indicative of winds exceeding 200 miles per hour. The presence of wind rowed structural debris, instances of very large vehicles such as buses, vans, and semi-trucks being thrown hundreds of yards to several blocks from their points of origin, the fact that some homeowners never located their vehicles, and the overwhelming extent and totality of the destruction in Joplin were also taken into consideration to conclude EF5 intensity. Immediately following the disaster, emergency responders were deployed within and to the city to undertake search and rescue efforts. Governor Jay Nixon declared a state of emergency for the Joplin area shortly after the tornado hit, and ordered Missouri National Guard troops to the city. By May 23, Missouri Task Force One (consisting of 85 personnel, four dogs, and heavy equipment) arrived and began searching for missing persons. Five heavy rescue teams were also sent to the city a day later. Within two days, numerous agencies arrived to assist residents in the recovery process. The National Guard deployed 191 personnel and placed 2,000 more on standby to be deployed if needed. In addition, the Missouri State Highway Patrol provided 180 troopers to assist the Joplin Police Department and other local agencies with law enforcement, rescue, and recovery efforts which also included the deployment of five ambulance strike teams, and a total of 25 ambulances in the affected area on May 24 as well as well over 75 Marines from the Ft. Leonard Wood Army Base. Within two years the city's workers and community groups compiled and published "Joplin Pays it Forward" to give recovery advice to other places hurt by disaster. The tornado also highlighted a new form of disaster response, using social media. This type of disaster response is now known as Social Media Emergency Management. News outlets began aggregating images and video from eyewitnesses shared through social media. Public citizen-led Facebook groups and web sites coordinated information, needs, and offers. The results were so effective the project became a finalist in the 2011 Mashable Awards for Best Social Good Cause Campaign. President Barack Obama toured the community on May 29, flying into Joplin Regional Airport and speaking at a memorial at the Taylor Performing Arts Center at Missouri Southern State University about two miles (3 km) north of the worst of the devastation. Obama had been on a state visit to Europe at the time of the storm. Members of the controversial Westboro Baptist Church were also scheduled to protest the same day in Joplin, but they did not show up. There was a massive counter protest that was organized in response to the Westboro protest, in which thousands of protesters showed up holding signs saying, "God Loves Joplin" and "We Support You Joplin." Engineers have criticized the tilt up construction of the Home Depot in which all but two of its walls collapsed in a domino effect after the tornado lifted the roof, killing seven people in the front of the store (although 28 people in the back of the store survived when those walls collapsed outwards). Home Depot officials said they disagreed with the study published by The Kansas City Star and said they would use the tilt up practice when they rebuild the Joplin store. On June 1, The Home Depot said it would have a new temporary 30,000-square-foot (2,800 m2) building built and operational within two weeks. In the meantime, it opened for business in the parking lot of its demolished building. On June 20, The Home Depot opened a temporary 60,000-square-foot (5,600 m2) building constructed by the company's disaster recovery team. In May 2012, the Missouri National Guard released documents showing that four soldiers looted video game equipment and a digital camera from a ruined Walmart during cleanup efforts. According to the investigative memo, they believed the merchandise was going to be destroyed. All the soldiers were demoted and had a letter of reprimand placed in their personnel file, but were never prosecuted, even though many civilian looters were prosecuted. Along with the Tri-State Tornado and the 1896 St. Louis–East St. Louis tornado, it ranks as one of Missouri's and America's deadliest tornadoes and is also the costliest single tornado in U.S. history ($2.8 billion). It was the first F5/EF5 tornado in Missouri since May 20, 1957, when an F5 destroyed several suburbs of Kansas City. It was only the second F5/EF5 tornado in Missouri history dating back to 1950. It was the deadliest U.S. tornado since the April 9, 1947 tornado in Woodward, Oklahoma, the seventh-deadliest in U.S. history. It was also the first single tornado since the June 8, 1953 F5 tornado in Flint, Michigan, to have 100 or more associated fatalities. 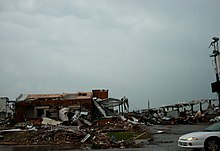 Wikimedia Commons has media related to 2011 Joplin tornado. ^ "Joplin Tornado – May 22nd, 2011". National Weather Service. September 15, 2011. ^ "Annual U.S. Killer Tornado Statistics". Storm Prediction Center. ^ a b c McCune, Greg (November 12, 2011). "Joplin tornado death toll revised down to 161". Reuters. Retrieved November 12, 2011. ^ "NWS Central Region Service Assessment Joplin, Missouri, Tornado May 22, 2011" (PDF). Retrieved June 19, 2012. ^ a b c d e f g h i j k l "National Weather Service Springfield, MO – Event Review – May 22, 2011". Crh.noaa.gov. Retrieved August 31, 2013. ^ a b c National Weather Service, Springfield MO (May 23, 2011). "Public Information Statement". NOAA. Archived from the original on June 28, 2011. Retrieved May 23, 2011. ^ Murphy, Kevin (September 20, 2011). "Many failed to heed Joplin tornado warnings, report says". Reuters. Kansas City, MO. Retrieved March 20, 2015. ^ a b Sarkar, Parka; Marshall, Timothy (November 7, 2012). "Supplemental Damage Indicators Discovered in Recent Strong Tornadoes". ams.confex.com. American Meteorological Society. ^ Murphy, Kevin. "Five patients who died in Joplin hospital suffocated". Reuters. Retrieved September 6, 2018. ^ Templeton, Steve (June 7, 2011). "My Experience In Joplin Surveying Tornado Damage". kmov.com. KMOV. Archived from the original on September 3, 2014. Retrieved August 29, 2014. ^ a b c d Max (August 8, 2012). "Images Detailing EF5 Damage from the Joplin Tornado". extremeplanet.me. ^ "Joplin MO Tornado: A tornado hit Joplin, MO Sunday". ky3.com. May 23, 2011. Archived from the original on May 25, 2011. Retrieved June 2, 2011. ^ "Girlfriend not surprised by Pizza Hut manager's heroics during Joplin tornado — NBCActionNews.com — Kansas City". NBCActionNews.com. Archived from the original on May 28, 2011. Retrieved May 30, 2011. ^ Bryan, Andra. "Residents: Ceremony 'wonderful tribute' to Joplin " Local News " The Joplin Globe, Joplin, MO". Joplinglobe.com. Retrieved May 30, 2011. ^ "Joplin, MO Tornado Imagery Viewer". NOAA. 2011. Archived from the original on September 7, 2011. Retrieved August 26, 2011. ^ KYTV (May 27, 2011). "National Weather Service offers insight into EF5 rating for Joplin tornado". Schurz Communications. Archived from the original on May 31, 2011. Retrieved July 4, 2011. ^ Kevin Murphy (May 23, 2011). "Tornado devastates Joplin, Missouri, leaves 89 dead". Baltimore Sun. Archived from the original on June 29, 2011. Retrieved May 23, 2011. ^ "Joplin searches through wreckage". USA Today. Associated Press. May 23, 2011. Retrieved May 23, 2011. ^ National Weather Service, Central Region Headquarters (May 23, 2011). "Numerous weekend tornadoes from southern Kansas, Missouri to Minnesota, Wisconsin". NOAA. Central Region Headquarters, NWS. Retrieved May 23, 2011. ^ a b "Powerful tornadoes kill at least 31 in U.S. Midwest". Kevin Murphy. Reuters. May 22, 2011. Retrieved May 22, 2011. ^ Unattributed (May 23, 2011). "Tornado kills at least 89 in Joplin, Mo". United Press International. Retrieved May 23, 2011. ^ a b c d "Joplin Tornado Situation Report 6 am May 24". Missouri Emergency Management Agency. May 24, 2011. Archived from the original on July 21, 2011. Retrieved May 24, 2011. ^ Wilson, Jenny. "The Greatest Cleanup on Earth: Circus Elephants Help Out in Joplin" – via newsfeed.time.com. ^ Aaron Smith (May 24, 2011). "Deadly Joplin tornado could cost $3 billion — May. 24, 2011". CNN. Retrieved May 30, 2011. ^ "DIFP reminds Joplin residents with tornado damage of 12-month insurance deadlines". insurance.mo.gov. Missouri Department of Insurance. Retrieved September 6, 2018. ^ Barker, Jacob. "Taking a hit". Columbia Daily Tribune. Archived from the original on October 19, 2011. Retrieved June 13, 2011. ^ Lieb, David A. (May 20, 2012). "Records show Joplin twister was costliest since 1950". The Sun News. Associated Press. Archived from the original on May 21, 2012. Retrieved May 20, 2012. ^ Murphy, Kevin (September 15, 2011). "Joplin tornado death toll rises to 162". Reuters. Retrieved September 20, 2011. ^ "Another death in Joplin from tornado brings toll to 155". Reuters. June 20, 2011. ^ "Joplin death toll up to 158". Archived from the original on February 3, 2014. Retrieved April 30, 2013. ^ Kennedy, Wally (May 29, 2011). "LIST: Missing persons list shrinking " Local News " The Joplin Globe, Joplin, MO". Joplinglobe.com. Retrieved June 2, 2011. ^ Martinez, Michael (June 1, 2011). "Joplin Missing List Reaches Zero; Death Toll 134". WJACTV.com. Retrieved June 1, 2011. ^ "116 dead from Missouri tornado; more twisters possible". CNN. May 24, 2011. Retrieved March 12, 2012. ^ "A fist coming out of the sky': Six miles of terror Along tornado's path, victims recall trauma, wonder about future". The Joplin Globe. May 29, 2011. Retrieved May 29, 2011. ^ Associated Press (June 18, 2011). "Newspressnow.com". Newspressnow.com. Archived from the original on March 14, 2012. Retrieved March 12, 2012. ^ "Joplin Tornado: 944 Pets Rescued, 292 Reunited with Owners, One Found 12 Days after Tornado — KSPR 33". Articles.kspr.com. Archived from the original on June 7, 2011. Retrieved June 4, 2011. ^ "Physorg.com". Physorg.com. Retrieved March 12, 2012. ^ Prevatt, David O.; Roueche, David B.; van de Lindt, John W.; Pei, Shiling; Dao, Thang; Coulbourne, William; Graettinger, Andrew J.; Gupta, Rakesh; Grau, David (March 29, 2012). Building Damage Observations and EF Classifications from the Tuscaloosa, AL, and Joplin, MO, Tornadoes. Structures Congress 2012. pp. 999–1010. doi:10.1061/9780784412367.089. ISBN 9780784412367. ^ "New Engineering Study Finds No EF5 Damage in Joplin". weather.com. Archived from the original on October 31, 2014. Retrieved June 12, 2013. ^ The Weather Channel (June 10, 2013). "New Engineering Study Finds No EF5 Damage in Joplin". The Weather Company. Retrieved September 30, 2017. ^ Haberman, Stephanie. "Announcing the 2011 Mashable Awards Finalists". Mashable. ^ Unattributed (May 23, 2011). "Remarks by the President after Touring Tornado Damage in Joplin, Missouri" (Press release). The White House Office of the Press Secretary. Archived from the original on June 2, 2011. Retrieved May 23, 2011. ^ Vu, Michelle A. (May 29, 2011). "Westboro Picketers a No Show in Joplin During Tornado Memorial". The Christian Post. Archived from the original on June 7, 2011. Retrieved June 2, 2011. ^ "Experts challenge Home Depot building design, codes after Joplin tornado". KansasCity.com. Retrieved June 28, 2011. ^ T. Rob Brown/Joplin Globe, AP. "Joplin starts to rebuild | The Columbia Daily Tribune – Columbia, Missouri". Columbiatribune.com. Archived from the original on June 4, 2011. Retrieved June 2, 2011. ^ "Home Depot marks opening of temporary store". Joplin Globe. Retrieved August 7, 2011. ^ Hathaway, Matthew (May 31, 2012). "Missouri National Guard soldiers took items from Joplin wreckage". St. Louis Post-Dispatch. Retrieved May 17, 2013. ^ Knapp, Dave; Boone, C.F. (May 5, 1971). Barron, Hal. (ed.). The Joplin Tornado. Boone Publications. Archived from the original on June 24, 2011. Retrieved May 25, 2011. ^ Belk, Brad (May 8, 2010). "May tornadoes struck Joplin twice in 1970s". The Joplin Globe. Retrieved December 6, 2011. ^ "F5 and EF5 tornadoes of the United States 1950 to Present". Storm Prediction Center. Retrieved December 7, 2011. ^ Edwards, Roger (October 25, 2011). "Tornado FAQ: The 25 Deadliest U.S. Tornadoes". Storm Prediction Center. National Oceanic and Atmospheric Administration. Retrieved December 6, 2011. ^ Unattributed (May 23, 2011). "2011 Tornado Information" [Preliminary tornado statistics including records set in 2011] (Press release). National Oceanic and Atmospheric Administration. Archived from the original on June 6, 2011. Retrieved May 23, 2011. Van Leer, Kevin (2013). "Storm mergers and their role in tornado genesis during the 2011 Joplin storm". M.S. Thesis. hdl:2142/44134.